Who is traveling with you? We are Cherie and Chris, proudly in service to our cat, Kiki. When folks want a simple answer, we just go with since 2006. Chris hit the road full time solo on April 1, 2006 – and we met soon after online – in a Prius forum, of all places! I (Cherie) started joining Chris for extended RVing trips in October 2006 for our dates and trial runs – and in May 2007 we set off on our first extended trip together of 7-months. 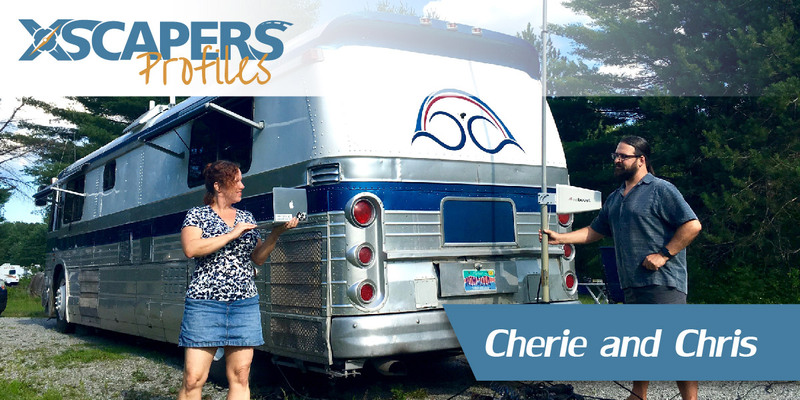 We then returned to my (Cherie’s) home to get it finally sold and our second RV built for the next phase – setting off with no return address in summer 2008. Are you full or part-time? 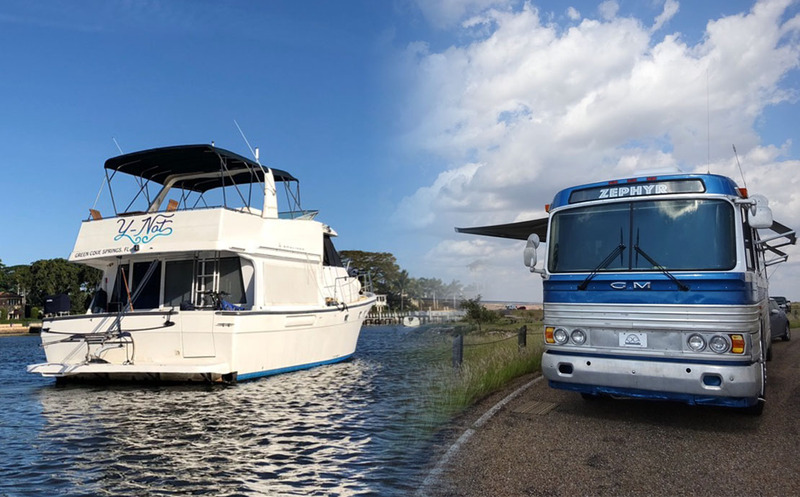 We were full-time RVers up until March 2017, when we purchased a cruising motor yacht to start exploring by waterways – slowly working our way around America’s Great Loop. Now we split our year between boating and RVing. 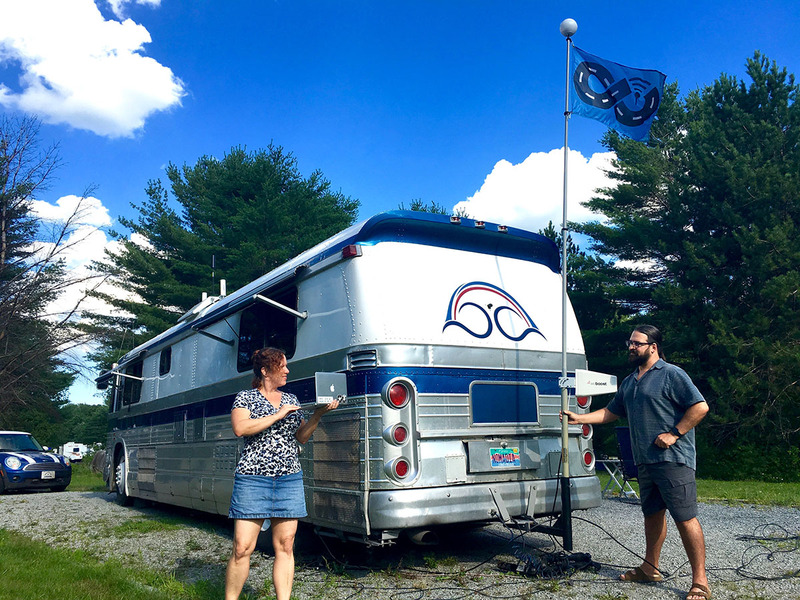 So we’re still full-time nomads, but part-time RVers. What kind of RV do you have? Our current RV is a 1961 GM PD-4106 – a vintage bus conversion. We purchased it already converted in 2011 and have done a ton of remodeling on it. 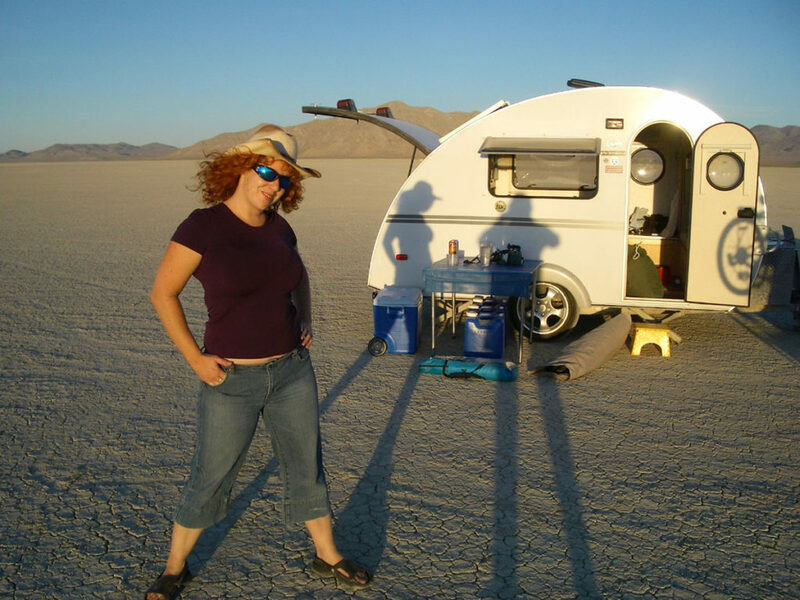 Our first RV we full-timed in was a 16’ T@B teardrop travel trailer, and then we did another couple years in a 17’ Oliver Travel Trailer (fiberglass egg). And since some might be curious, our boat is a 1999 Bayliner 4788 – a 47’ motor yacht. We’ve come a long way since 2006! What got you interested in living the RV life? Chris was initially inspired by the original technomad – Steven Roberts. Steve had set off in the early 1980s on a ridiculously geeked out recumbent bicycle – computing his way across America. Before that, Chris’ family had taken vacation RV trips growing up, so RVing had always been in the back of his mind. When he was ready to give up his Silicon Valley tech career, starting his technomadic dreams off with an RV was a natural choice. Cherie originated her nomadic journey from Florida, where she already owned a small pop-up camper for getting out camping in Florida state parks and as a back-up home she could tow out of hurricane harm’s way. She had previously considered going full time RVing with a former partner who traveled for work. She had run her software company from home since the early 1990s – so she could have easily worked from anywhere she could get online. So when we met online, our lives were already nicely aligned to merge. How do you fund you travels? When we first hit the road we just essentially continued our existing careers. Chris was doing consulting related to his prior work in mobile tech. Cherie continued to run her software development business. Over the years however we’ve done many things – from tech & strategy advising (including helping launch RVillage.com and Xscapers), developing our own line of mobile travel apps, packing boxes at Amazon, volunteering as lighthouse tour guides, managing a political campaign office, and some freelance writing. Oh, and we’ve gotten some beer money from sharing our travels on technomadia.com. But in 2014 we launched MobileInternetInfo.com after years of fielding questions about how we stayed online to work remotely. It’s a resource center for education and news about mobile internet options for RVers and cruisers. A perfect meshing of our backgrounds and passions. It’s now our primary income source. What is your camping style? We love variety.. so let’s go with mix it up. We’ve designed our RV to be versatile and comfortable wherever we’re at. We love off grid boondocking, exploring our amazing natural resources in public parks, staying in unique locations scouted out by services like Harvest Hosts, to driveway surfing with friends we’ve made to urban stays near city centers. 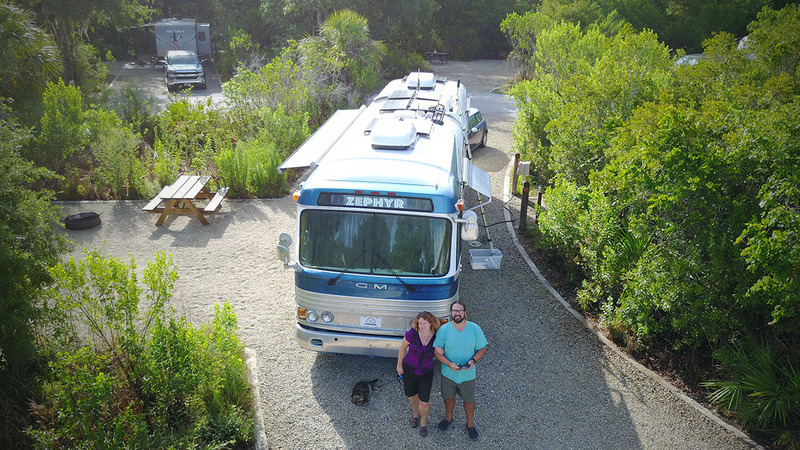 We do tend to stay away from commercial RV parks, but some have been the right choice at the time – and some are actually pretty awesome. For pace, we’re usually restricted to no longer than 2 weeks stays since our preference is public parks with time limitations. We usually find we’re ready to move on every week or two anyway. What do you seek out when traveling? The technomad trifecta of amazing view, free/cheap and super-fast internet. We just generally love being in the perfect spot – and soak up what is the unique about a location. Can we just go with ‘Yes’? After 12+ years of full time travel, it’s really difficult to have favorites. Everyday is a unique experience. What has been the hardest aspect for you while traveling? We do miss the consistency of a day-to-day tribe of close friends. We’ve just not yet found it on the road. Sure, we meet amazing lifelong friends that we treasure – but what brings us together is the very fact that we’re each on our own consciously chosen life path, and that our times together are just intersection points. 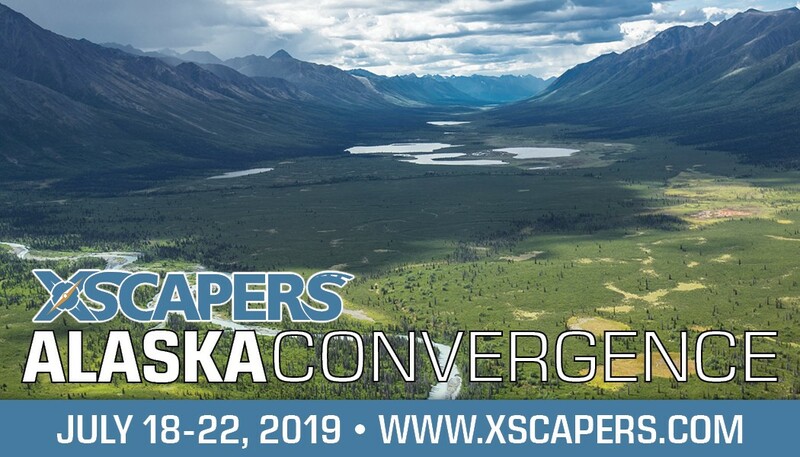 How many Xscapers convergences have you attended? The Xscapers Convergences are something we felt would be core to the concept of this organization. 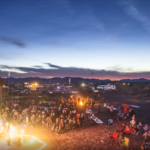 It was seeded from both the original Escapades and some of our own convergence experiences we’ve orchestrated over the years – including hosting our Camp Nomadia Burning Man theme camp from 2008-2011, and a winter long 40+ rig meet up in Cedar Key, Florida in early 2014. We had the idea of a roving community of nomads who met up across the land in events a bit more casual than rallies but more organized than just camping together. We also knew we were not the folks to spearhead that – being the social introverts we are. 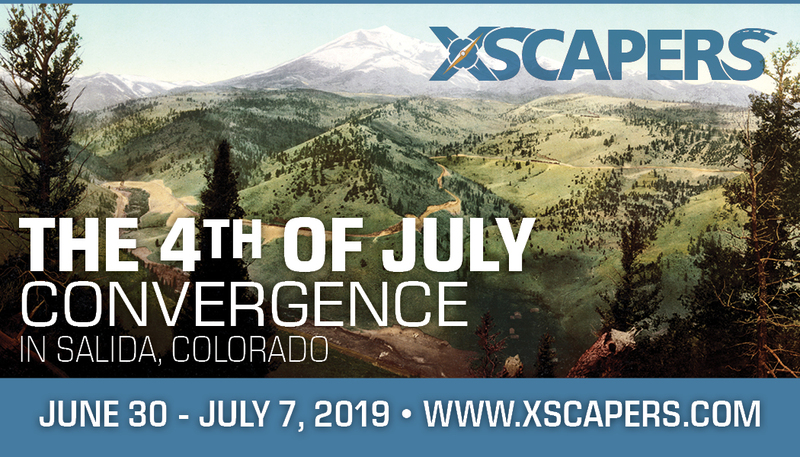 I guess you could say the very first Xscapers convergence was actually at Escapade 2015. We very strategically put out invitations to future-Xscapers to attend that Escapade, knowing they would be there for the birth of something that had been in the planning for over a year. We then attended the debut of the first publicly announced convergence at the Albuquerque Balloon Fiesta, followed up by the first Quartzite ‘happy hour’ (where we went renegade and invited Xscapers to join us for a week or two in the desert to continue the party – now known as the Annual Bash), and then the Vermont Escapade in summer 2016. We’ve not been back to an official Xscapers convergence since – but we’ve been watching the seeds we planted being carefully tended to and grown by the Xscapers team. We could not be prouder to see this little concept become its own thing, flavored by the influences of those called to the core mission. We look forward to returning to the convergences in late 2018 and early 2019. Not knowing about a Convergence shouldn’t be the reason you don’t attend one. 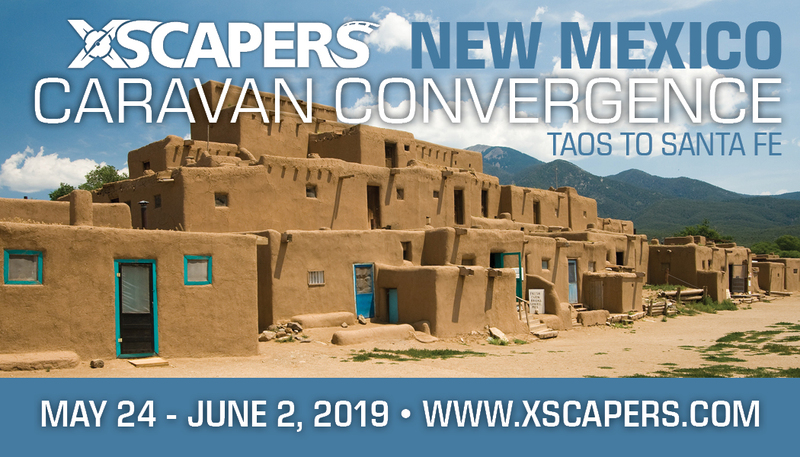 Be the first to learn about new Xscapers updates and Convergences. Cherie is a pretty extreme introvert but has learned how to cope with it to not come off as a totally socially awkward dork and still be present at social gatherings. But she definitely needs to retreat after social events to recharge. Chris can go either way depending on the situation. Tell us something weird or fun about yourself. We tend to consider “weird” to be pretty normal – and we are always up for interesting and unconventional new experiences. On the fun front – we are both avid Pokemon Go trainers. It is a fun low-stress excuse to get out and go walking to explore the new areas we are in, and by chasing after Pokestops we’ve made plenty of interesting serendipitous discoveries. Would you rather deal with a leaky sewer hose or a flat tire on the RV? In our experience you usually don’t get to choose which you have to deal with 🙂 It’s best to be prepared to handle whatever calamities the road will toss at you. If we had a choice, we’d take either a leaky sewer hose or flat tire (or heck, give us both!) any day over an overheated engine, failed air break system on a two lane downhill road, exploded steering pump, or your RV being held hostage for months by a slipping shop schedule. Where can people find you online if they want to follow your travels? 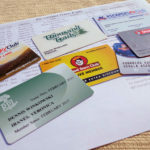 If you found your way here through a web search and you are wondering, “What the heck is an Xscaper?” Check out this post. We hope to see you at a convergence soon!